Martha Matthews, the Executive Director of Christian Homemaking, "knows that you wear a LOT of hats... you’re a Christian, a wife, a mother and the manager of your home. You want to fulfill all your roles, but sometimes it can be a challenge. How do you keep up with all your responsibilities?" Christian Homemaking was formed out of Martha's desire to bring a Christian perspective to managing your home. This website has all the tools and resources that you will need to succeed in your roles as a woman who desires to keep God first in her life. 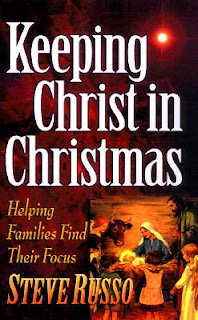 Martha has just announced that Steve Russo, author of "Keeping Christ in Christmas" will be interviewed on December 4th at 10:00 A.M. Pacific Time. Register today for this free presentation. Let's keep our focus where it should be - today and every day!